Most of us store our silver in a nice fancy case to prevent tarnishing. The problem is, no matter how elegant the container is or what storage method you use, your silver ends up severely tarnished. Badly tarnished silver is not something you can proudly wear or display at your next party. You can use silver polish to restore your silver, or you can use a natural silver cleaner. Using a natural silver polish to restore the shine to your favorite pieces is not only best for the environment, but it is better for your home, too. Silver polish often contains harsh chemicals, while it will clean and polish your silver, you don’t know what else it is going to do. 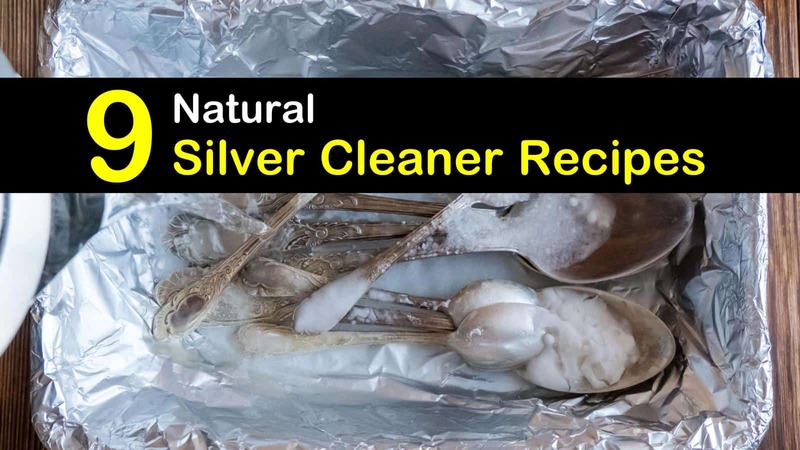 A natural silver cleaner is safe to use on everything, including cutlery and jewelry. Is Natural Silver Polish Safe for All Pieces? As you open the box, you notice the grayish haze of silver tarnish, also known as silver sulfide. This silver sulfide needs to be removed, but not all silver pieces are created equal. DIY silver polish recipes are safe for most items you own, but you do want to proceed with caution – fragile or treasured pieces need to be cleaned and polished by a professional. Many DIY silver cleaners require the use of boiling water and scrubbing, which can damage your more delicate pieces. You can use one of these homemade tarnish remover recipes to restore your silver safely. Sometimes you are faced with tarnish that won’t come off using a single DIY method. For stubborn tarnish, you may need to use several home remedies for silver cleaning. Start by soaking your silver pieces in an aluminum pot mixed with baking soda and salt. After drying each piece, apply a small amount of toothpaste using a soft bristled brush. Buff each item with a clean, soft cloth. A natural way to clean silver involves toothpaste and a flannel cloth. To polish or clean tarnished silver apply a small amount of toothpaste onto a flannel cloth. Rub the toothpaste on the silver. Rinse the toothpaste off under warm water and hand dry pieces with a soft towel. You can use organic toothpaste, or you can use what you have in your medicine cabinet. Toothpaste contains gentle abrasives and mild cleaning agents to cut through tarnish. If your silver has an intricate design or numerous nooks and crannies use a soft toothbrush to reach those small places. Make a baking soda and water paste. Use your fingers, a soft toothbrush, or a clean cloth to rub the paste over the silver. Rinse silver under warm running water to remove the paste and dry. Aluminum pots work best, but you can use enamel pots lined with aluminum foil. Other metal pots may cause a chemical reaction with your sterling silver. A boiling water bath is the most natural way to clean silver, but the pieces must be small enough to fit into an aluminum pot. Pour in enough tap water to cover everything. Add sea salt and baking soda, and then bring to a boil for three minutes. Allow water to cool, remove silver and scrub with a clean cloth in warm, soapy water. Polish with a dry cloth. Baking soda is the best way to clean coins. Line a container with aluminum foil, cover with baking soda and add the coins tarnished side up. Cover the coins with more baking soda and fill with hot water. Allow to soak for five minutes or longer depending on how tarnished the coins are. Use paper towels and some elbow grease to scrub coins, rinse in cold water, and let dry. This DIY silver jewelry cleaner requires a skillet lined with aluminum foil (shiny side facing up), water, and white vinegar. For each quart of water used, add one cup of vinegar. Bring the solution to a boil, add silver and wait five minutes, then turn off the stove. Remove jewelry and rinse in hot water. How to polish pewter depends on the type of pewter you have. Silver pewter doesn’t require regular polishing. Cleaning the silver pewter with warm water and some dish soap removes dirt and grime. If it looks dull, use a small piece of steel wool to buff as you polish gently. Buff your silver pewter in the same direction as the grain until restored to its original appearance. Lemon juice is an excellent cleaner as the acidity cuts through almost every kind of stain. Recipes using lemon juice or merely polishing the pieces with lemon juice and a clean cloth work quickly to restore your silver’s shine. Add ingredients to a large bowl, put in the silver and allow to soak overnight. Rinse with cold water and dry. To accommodate larger pieces and collections, double or triple the recipe. To clean your silver coffeepot or other items, line a bowl with aluminum foil and fill with hot water. Add one tablespoon of your favorite powdered laundry detergent. Soak your silver items for one minute. Rinse with cool water and let air dry. Once your silver spoons, teapot, coins, etc., are cleaned and polished you want to do everything you can to prevent tarnish in the future. One way to prevent tarnish is to rub a small amount of hair conditioner onto your clean silver. Store all silver items in anti-tarnish bags. To prevent corroding, never store silver metal using rubber gloves or near rubber items. If you were looking for a great tip or two for cleaning silver, we hope you discovered it here. 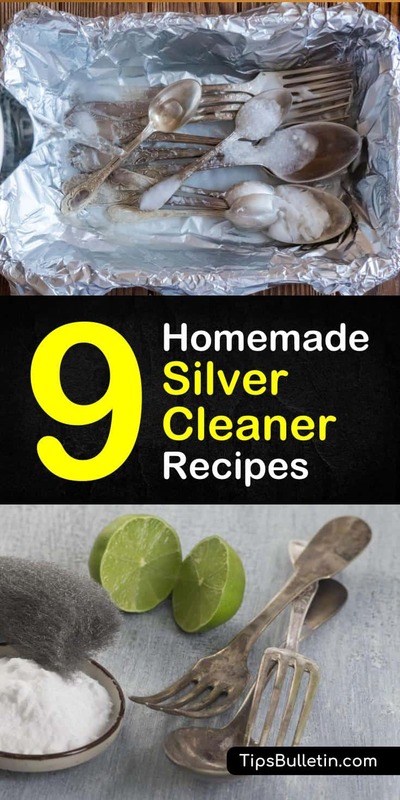 If you found any of these natural silver cleaner ideas useful, please take a minute to share these silver cleaning tips with others on Facebook and Pinterest.